Governor’s Island is a private, gated community situated on the Denver side of Lake Norman. This beautiful island is one of the lakes most sought after addresses. Incredible waterfront home sites and beautiful homes will offer you the most incredible views on Lake Norman. 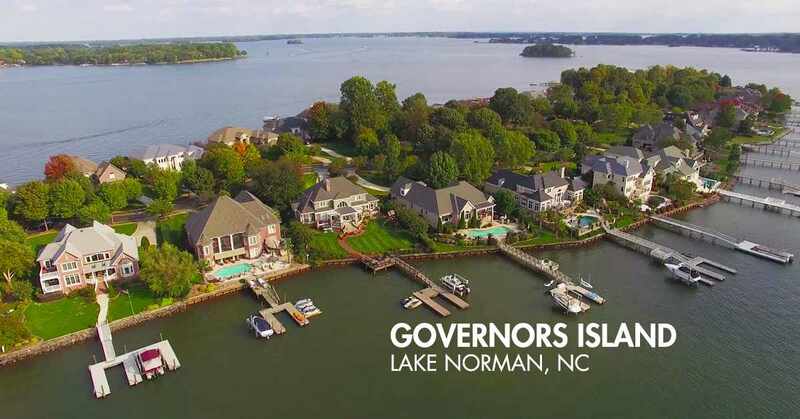 Today Governors Island is one of the crowned jewels of the west side of Lake Norman which is conveniently located just north of Charlotte North Carolina. With it’s beautiful Bradford pear tree lined bridge to the front gates and gardens, winding road, beautiful lakefront homes and panoramic waterfront vistas; Governors Island is a highly sought after community where 42 lucky families call home. Traveling back in time just 300 years ago life on the Catawba River was considered hostile territory and home of the Catawba Indians, known as “the river people”. In 1749 pioneers weary from long journeys came with heavily laden wagons filled with not only personal belongings but with hearts brimming over with hope of the new frontier. Their dreams were their fuel that fired their hearts to work hard, sun up until sundown, to tame this wilderness and make it their home. Resentments flared against the heavy British taxes that led to The Civil War and the dawn of a new country. The ravages of war left a hefty scar along the Catawba River where the people were simple existing and not thriving. Three visionaries came up with the idea to dam the Catawba River Basin to breathe new life into this beautiful land. William S. Lee, Dr. Gill Wylie and James B. Duke had a dream to harness the river and bring power and opportunity to the South. 1928 brought 10 new dams making the area famous and known as “the most electrified valley in the world” with 12 power stations harnessing the power of the river basin changing the area forever. It was not long before this sleepy area awoke to the dawn of the Industrial Revolution. 1959 was the official ground breaking for the construction of the dam that created Lake Norman. It took 6 long years to construct and fill the lake, which was named after the retired Duke Power President, Norman Atwater Cocke. People nicknamed this beautiful lake “the inland sea” as it seemed enormous, the second largest man-made lake in North Carolina. It is 34 miles long and 8 miles at its widest point. And 130 feet at its deepest point. There are 520 miles of shoreline with 32,500 acres that are filled with 3.4 trillion gallons of water. It’s hard to believe in early 1960’s the pioneers to Lake Norman were attempting to sell prime water frontage for a mere $1000 with great difficulty. The completion of I-77 finally brought civilization to the Lake Norman area in 1965. Governors Island was the home of wild goats back in the 1970’s. Locals remember the spectacle of watching the wild goats frolic and play while staking claim to the island for their own. From goats to gorgeous, in just 40 years Governors Island has blossomed into a rare beauty. I doubt the pioneers would have ever envisioned the future would be so bright for Governors Island. Elegance and design are not skimped in these homes. Square footage ranges from 3200 to over 7000 laying on homes sites from 0.27 to 0.6 acres. These Transitional, Mediterranean to Contemporary homes are priced from $700,000 to over $2 million. This luxury island will surely hold your dream home if you are looking for high end luxury living. If boating is your style most of these homes are waterfront with their own boat slips and piers. Golf is only a few minutes away. Located conveniently 20 minutes from Hickory, 30 minutes to Statesville and about 45 minutes to Charlotte you will find shopping within minutes of your home on stunning Governors Island.